Welcome to minicabit, winner of ‘Digital Business of the Year’ at the Lloyds National Business Awards 2018, the easiest way to find and book the cab you need today. Whether you want to travel near or far, the minicabit app will help you find and compare cheap cabs that you can book on the go. Using minicabit will get you the best taxi fares for a lift anywhere in the UK, not just for London cabs. It’s simple and inexpensive, so you can ditch the London Underground Tube Map and book a taxi cab instead! 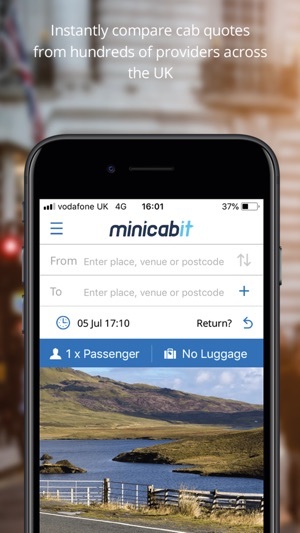 With minicabit, you can book anything from an airport transfer to a ride in more than 300 towns and cities across the UK. As the UK’s largest cab comparison service, we can find minicabs in London, Manchester, Birmingham, Bristol, Oxford, Edinburgh, Nottingham and Reading. both ends of your trip and rated by customers. 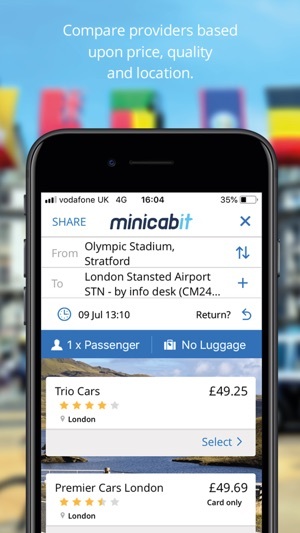 • minicabit is available in over 300 towns and cities across the UK, including London, Edinburgh, Glasgow, Birmingham, Bristol, Manchester and Oxford, getting you the cheapest cost possible when booking, as it’s the UK’s largest cab comparison service. • A meet and greet by taxi drivers when picking you up for your airport transfers, from Heathrow Airport, London City Airport, Stansted Airport and more. 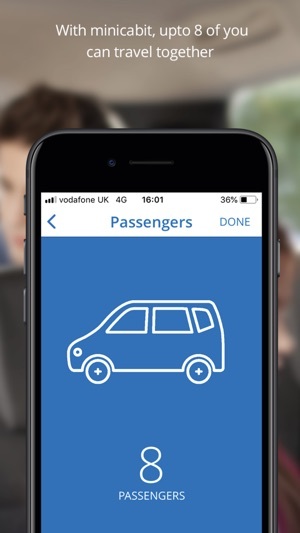 • Our free app uses our taxi fare calculator to easily book a cheap single or return trip mini cab service for 1 to 8 passengers, including for Executive cars. • Enter any UK location or choose from either a list of thousands of popular Points of Interest such as Wembley, The O2, Birmingham NEC and Old Trafford. • We’ve got London minicabs covered, so whether it’s the West End, Soho, Islington, Shoreditch or Clapham, if you need a ride around town, we’ll get you home safe and sound. • Easily pick your taxi destinations from your most recent searches, using the GPS ‘locate me’ feature, or by placing a pin on our UK wide map. • Receive free notifications of your minicab hire booking by SMS and e-mail. • Got extra luggage? 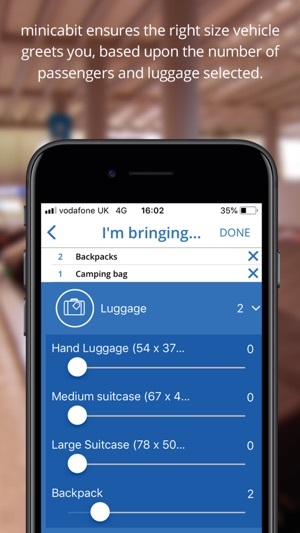 Tell us how many pieces and we will work out the right size car for your airport transfer or local trip, whether it be suitcases, camping gear or boxes! • After using our taxi fare calculator to compare prices and find your best-priced fare, pay by cash, PayPal or card, accepting debit or credit cards with Visa, MasterCard or American Express. • Keen on booking your journey for a group? With up to 7 additional via options, minicabit is perfect for getting everyone picked up / dropped off exactly where they need to be. 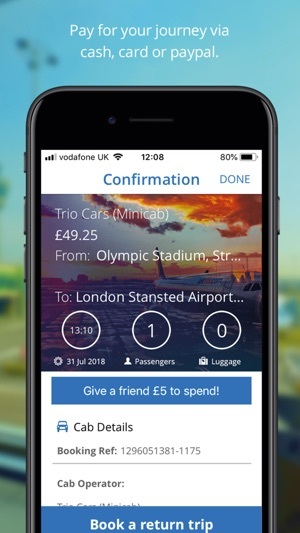 minicabit is offered as the trusted preferred partner on many of the UK’s leading travel & leisure websites, such as Heathrow Airport, Visit Britain, London City Airport, Expedia and Royal Ascot. If you’re in search for a minicab to London from another part of the country, then we can find local cab companies that you can compare and hire online with ease. Download minicabit today and get the cheapest taxi quote now in 300 towns and cities across the UK. It’s even better than public transport, because it’s always available and just waiting for your call. Fair enough the taxi was on time and was a reliable service. However minicabit charge extortionate amounts for their service it seems. We paid £17 through minicabit for a taxi which once we were inside the car, realised how much of a mistake it was. When we were on the way to our destination we were chatting with the taxi driver who questioned us as to why we used the service and told us to avoid it in future and book direct with the taxi firm itself. This is because of how much of a rip off the company behind the app actually is. We were charged £17 for a trip which should’ve cost no more than £8 which is highly disappointing as you can imagine. I’m sorry but there appears to be so much financial greed behind the idea of this app and I can guarantee you that you have now lost 4 potential customers in the space of one trip. We're sorry to hear you had an unpleasant experience. We recommend Cab companies to advertise the same price as they would quote or charge over phone, however, they set their own prices on the platform. We will investigate this matter with the cab operator you selected for your booking, A1 Taxis from Rotherham to make sure they have set the correct prices on our platform. I really liked using this app at first. I liked the chat feature and the service I got was good. However, every time I ordered a cab and choose a provider, the cab driver would always try and grill me about why I booked through minicabit and not directly through them. Regardless of the provider, I got the same talk. It made me think that perhaps MiniCabit doesn’t have a good business relation with the cab providers it works with. Today I booked a cab, paid for it and got my confirmation. I later received an email and text telling my my provider had been changed. Then I got another message. When my cab never came, I called the provider (contact details provided my MiniCabit via sms). The provider did not know about my booking. I then immediately contacted MiniCabit via chat in their app. I was given a new contact number for a new provider and told that provider had my booking. Called the number, and they didn’t know about my booking. Happens once, I can put it down to human error. But, happens again after I complained, this is totally understandable. Time to delete the app (once I get my refund). Addition to the above. On chat with the company via app, told to wait while they process my refund. Now I get a message stating my session has been closed. OMG! This is more stress than I need. Wish I could award it as zero stars. We are sorry to hear that your experience with the cab operators you had selected was unsatisfactory. This is uncharacteristic to the level of service the providers usually offer. We apologise for the inconvenience you were caused, please refer to your email for further details about your refund. (1) App does not let you see your upcoming bookings or any option to modify it. (2) Live Chat does not exist - No agents available on weekends or nights. No phone support. No one responds to emails. (3) They Charge about 20-25 % more than booking direct. Arrow Taxi charges £85 for booking direct to Worthing from Heathrow. MiniCabit charges £105. Starlite Cars charge £80 and MiniCabit charges £100. You would think for that extra markup that they charge their customers, they would have the decency to actually have customer service but no. No email, no live chat, no phone. (4) Taxi Operators also know that they can pass the blame to MiniCabIt so they just are rude to the customers, cancel when they want to, and say file a complaint to minicabit - like Starlite Cars in London. No need to download the app if there is nothing value added here. Just go direct to Taxi Operators - or better yet - if you are not in a rush - take the train. Avoid Cabs in the UK. They are not regulated. I was looking for a place to submit complaints for Taxi Operators - there is none. That is why they can be rude to customers. We're sorry to hear you had trouble with the app. This has been reported and fixed in the meantime and we appreciate the feedback, this has been taken into consideration. Please note that the cab operators set the prices, we simply display them for the trip you are searching. Should you require any assistance, our Livechat service operates 24/7, our agents are more than happy to help.